This blog features opinion, analysis and scholarship on the documented benefits of divided federal government (restrained growth of spending, better legislation, greater oversight, fewer wars, and overall better governance). 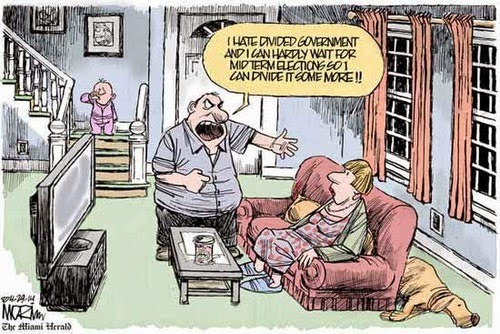 In that context, we also note the general view often expressed by financial pundits and market analysts that the stock market prefers divided government. 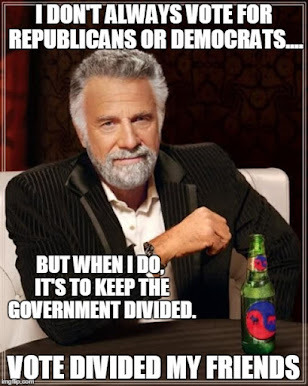 This may be counter-intuitive but is certainly true: While a single party controlled Republican government may be better for business and investors than a single party controlled Democratic government, neither is as good for business as any configuration of divided government (President, Senate, House not all one party). Now the other shoe may be dropping. The stock market is a "discounter" of all known information affecting the market including the impact of politics. That simply means that if information that will affect stock prices is known to investors, then the distilled belief of all investors can be found in the current market price. Brett Arends, writing in the Wall Street Journal Op/Ed page last Friday, suspects that recent market action may be discounting a single party unified Democratic party government in 2009. "They say Wall Street sets prices by anticipating events, and there's no better example of that than the investor who were busy Friday factoring the results of the Iowa caucuses into their outlook... The Iowa results sent tremors under the political establishment. They may eventually shake up the world of finance too... Sen. Obama, with his broad appeal to many independents, would probably be a stronger candidate in a general election than Sen. Clinton. Meanwhile the Republicans are in disarray. And Mitt Romney, who could be formidable in a general election, has suffered a serious setback in trying to get there. So the chances have risen that Washington could see single party rule again, with Democrats in charge at both ends of Pennsylvania Avenue... Wall Street doesn't tend to like single-party government too much. It prefers gridlock to activism. Periods of divided government have tended, on average, to coincide with better stock market returns than periods of single-party rule, although there are circumstantial reasons too." Frankly, this far out from the election, I am skeptical about attributing any short term market moves and in particular last week's post-Iowa caucus / new year sell-off to investors anticipating a single party Democratic government result in November. ... and the Dow Jones Index fell over the same time period. These are very big moves in a very short period of time. Perhaps investors are trying to digest what an Obama presidency and a unifed single party Democratic government will mean for 2009. Technorati tags: divided government, 2008 election, Investing, Barack Obama, Ken Fisher, Hillary Clinton.